Save the Dates! 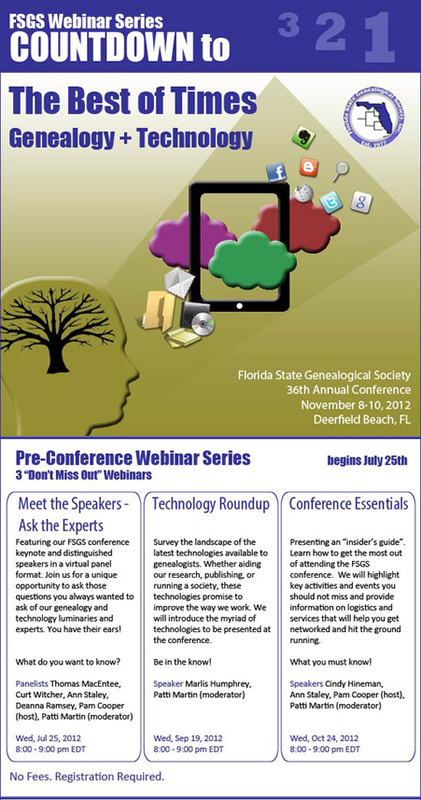 The Florida State Genealogical Society is proud to announce a series of three free webinars that will provide a sampling of the expertise and hot topics to be covered at the upcoming FSGS 36th Annual Conference: The Best of Times: Genealogy + Technology”. Hear from the best in the field on the latest trends and resources in genealogy, technologies for genealogists, as well as specifics about getting the most out of the conference. Advanced registration required for each webinar. Only one more webinar to go! The on-line registration option for the 36th Annual FSGS Conference is now up and running! Members MUST log in first to automatically get the member rates. There is a reduced Early Bird rate that ends on October 22, 2012. Check the website link for details!